Part 1 offered an abstract and introduction to the blog series, as well as an in depth look at direct gravure coating. Part 2 will examine both reverse gravure coating and differential offset gravure coating. Part 3 will wrap the series up with an explanation of reverse roll coating and offer a brief conclusion. This method employs the basic features of direct gravure coating, except that a speed differential is created between the applicator roll and the web, with the applicator roll rotating opposite the direction of the web. The reverse gravure technique takes advantage of the film splitting characteristics of most coatings. Figure 4 shows this application, whereby the web is carried by the impression roll, which may or may not be independently driven, depending upon web tension and the ability of the web to rotate the roll. The applicator roll is driven in the opposite direction to the web travel, thereby creating a coating which is both metered and smoothed. Depending upon the coating viscosity and flow properties, the rate of speed of the applicator roll will alter the amount of coating applied. This allows coat weight variation while using the same engraved applicator roll. While this technique offers finer coat weight control, it is limited by the characteristics of the coating. Most coatings will split, or separate when they are applied/transferred from one surface to another. It is important to operate a coater at a speed where the film splitting works to advantage in the coating process. If the differential speed between the web and applicator roll is too small, “ribbing”, (machine direction lines), may develop. This usually occurs if the applicator roll speed is too slow and the coating nip is starved of coating material. This is a function of the coating viscosity and its surface tension. One must therefore operate above that speed or change the coating material flow properties. Conversely, if the speed differential is too great (i.e. the applicator roll turns too fast), the phenomenon of “cascading” (seashore effect) can result, this time due to coating flow through the nip, resulting in surges on the downstream side of the nip. Among the advantages to this coating technique is the ability to smooth a higher viscosity gravure application that is deposited in a discrete pattern from a pyramid, quad, or tri-helix cell applicator roll. Further, low dry coat weights can be controlled accurately by altering the applicator roll speed. This is more particularly true when using coatings that exhibit increased resistance to shear (Newtonian coatings), than when using shear-thinning (thixotropic) coatings, where little variation in coat weight is seen with applicator roll speed change. Reverse gravure coating usually employs the use of gap control devices, to control the gap between the impression and applicator rolls. This is particularly important with heavier gauge materials. The thickness and hardness of the elastomer rubber covering on the impression roll plays a role in the coat weight application. A thick rubber covering allows more coating to pass through the nip. For thin rubber coverings, the gap between the impression and applicator rolls affects coat weight more dramatically than the rubber covering thickness. You cannot operate Reverse Gravure Coaters with a tight nip because of the counter rotation of the applicator roll to the web. 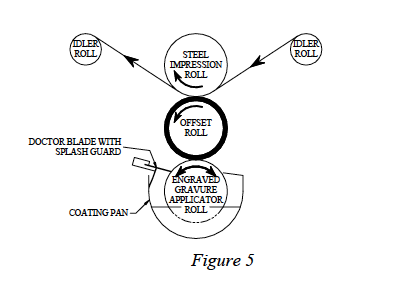 A method of coating, shown in Figure 5, that applies material to a web, through an intermediate smooth roll that has been furnished with coating material from an engraved applicator roll. The impression, offset, and applicator rollsare independently driven. The speed differentials between the rolls make this method of coating particularly well suited to the application of viscous, high-solids coatings to a web, at low coat weights, by using the technique of film splitting. The applicator roll can rotate in either the forward or reverse direction. The impression roll may be a chrome covered steel roll that supports the web to be coated. The transfer roll is elastomer rubber covered, with the covering thickness and durometer affecting the coating transfer. 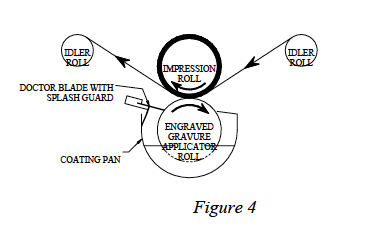 The applicator roll remains an engraved roll. Gap adjusting devices are used between the various roll sets to allow appropriate coating transfer to the web. The addition of the third roll allows coating to be transferred to the web by the action of the applicator/transfer rolls and the transfer/impression rolls. This promotes low coat weight products at high line speeds. The combination of the speed and gap control features makes this coater the most versatile type for gravure coating applications. Most Differential Offset Gravure (D.O.G.) coaters are designed to operate in the direct (Figure 6A) and reverse gravure (Figure 6B) modes, by altering the web path as shown below.